SL Minister of ‘Labour, Trade Union Relations and Social Empowerment’ Daya Gamage, widely known for his anti-Tamil politics in the district, has been working behind the scene to terminate the operation of the only government Tamil school in the town, Ampaa'arai Tamil Maha Viththiyaalayam, Tamil civil officials in the East told TamilNet this week. In 2016, the then Zonal Director of Education, Sunil Gunathilake, a Sinhalese, handed over the classrooms of the school to the ‘National Youth Corps’ under the influence of Mr Gamage without consulting the principal of the school, K Loganathan, they said. 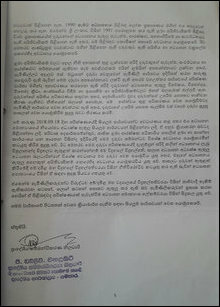 However, the racist minister has deployed a Sinhala journalist and the ‘Sri Lanka’ Human Rights Commission office in the district to harass the Tamil principal and a teacher to issue leaving certificates to the students in an apparent bid to cease the operation of the Tamil school, they said. The principal was using his office room to provide education to two Tamil students who joined in January. A Sinhala journalist Sandana Liyanage Hettiarachi, who works in the ITN, was sent to the office room on 15 May 2018 when the principal was on vacation. 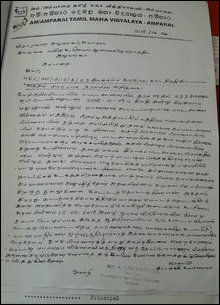 The journalist harassed the Tamil female teacher with questions while she was teaching a student, Sivakumar Mathushan. The young student also felt intimidated by the intervention and his family concerned with his security started to think about withdrawing from the school where armed Sinhala youth connected to the ‘national youth corps’ were also wandering around. 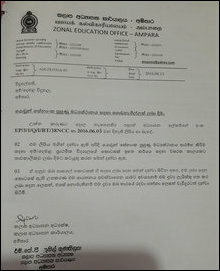 Mr Loganathan, the principal of the school, was requesting the Zonal Director of Education to release classrooms for education activity in January 2018. He was pointing out that it would be a violation of the fundamental rights. 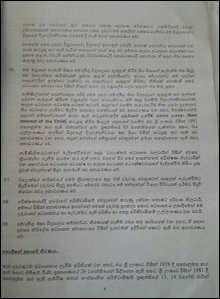 The Sinhala administrative system in Ampaa'rai, under the influence of SL Minister Daya Gamage, decided to deploy its ‘Human Rights Commission’ office in Ampaa'rai against the school. The Human Rights system started to argue that it was not good for the children to study at an environment without classmates. 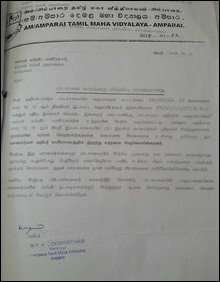 While there are several other schools in the island operating with one or two students elsewhere, the SL Human Rights system is only concerned about the school in Ampaa'rai where the Sinhalicised system wants to see the ultimate termination of the Tamil school, the civil sources in the East told TamilNet. The parents have not complained to the HR Commission. However, a journalist intervening in the matter with political agenda has approached the commission, they said. The Tamil civil officials also pointed out that the so-called Human Rights Commission was sending its communications to the Tamil school in the Sinhala language. “This is the place where one was supposed to go when the SL system linguistically discriminates,” a Tamil official who didn't wish to be named said.